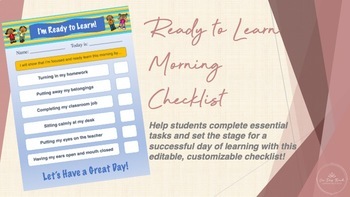 Set the stage for a great day by offering children this effective READY TO LEARN checklist. It will ensure that your students complete essential tasks each morning and are focused on beginning a successful day of learning! This product is great to use with page protectors and dry erase markers so students can independently check off tasks every morning. Just have each child store a copy in his/her desk or cubby! This product is available for personal/classroom use and is a completely editable PowerPoint template. Just change out the tasks to fit in with your classroom’s unique morning routine.